Jose Mourinho have not officially changed his name of David Mourinho, we are certain that he will not. 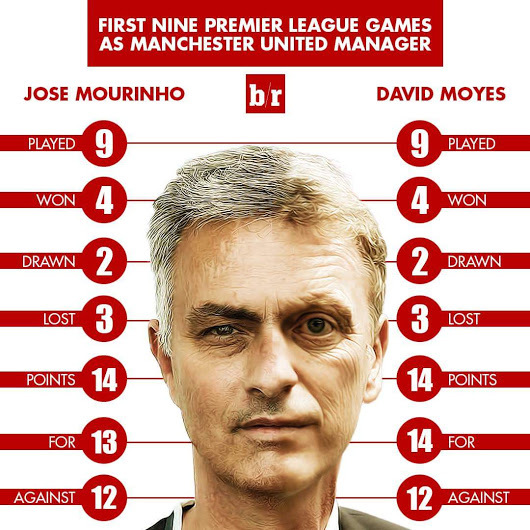 However, the stats of Jose Mourinho and David Moyes as managers of Manchester United after their ninth game for the club proves that they share some things in common. Look at the stats below to see what they share in common. The image was posted by Milan Is Back in a Google+ community, and a comment to the post reads: "Moyes never spent the millions Mourinho spent." What is your opinion about this two coaches of Manchester United football club.